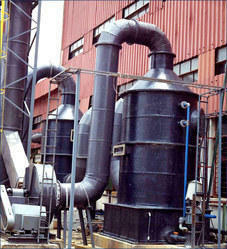 Leading Exporter of fume scrubbers from New Delhi. Type of Air pollution control equipment: Wet Scrubber, Venturi scrubber, Packed Bed scrubber. Quality of fabrication: Made out of CNC machines with very accurate finishing, smooth finish from outside of the body giving a good aesthetic view of the equipment.